You will find a strange mix of interests on this site. Music, spinning, knitting, soapmaking and ham radio are represented here along with a few random thoughts about different things. The new home and the local wildflowers and why do people hate dandelions? ARocket is dedicated to Amateur and experimental rocketry with the goal of Cheap Access to Space. My own thoughts about space and safety are now posted along with more blatherings. Or visit my blog. My desk ornament and assistant, Snrbl, in his usual position. This picture is one of my next spinning projects. 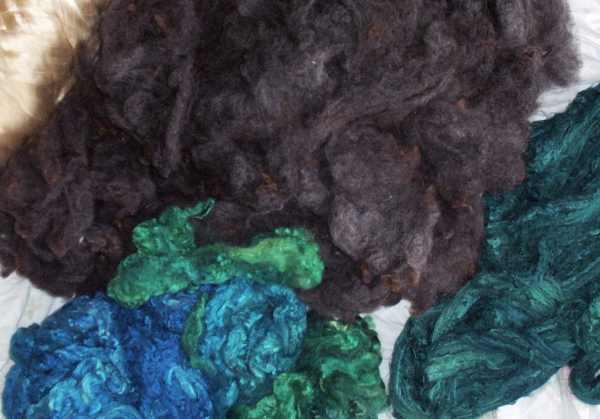 I'll be blending the dyed silk with the wool which is very dark gray. The light golden stuff in the top left is the undyed tussah.